Core parking basically makes your processors go into a sleep state known as (C6) and is supported by most knew processors. This allows your computer to save power. There is a trade off for disabling parking. 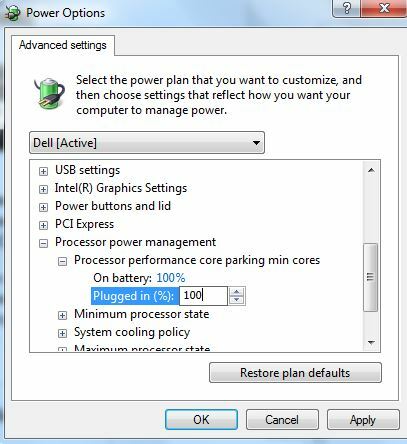 If you use a laptop or tablet, you may notice a slight difference in battery life once you disable core parking on your CPUs. If you disable core parking on your CPUs, your computer may have faster benchmarks. (Reported higher frame rates by gamers and power users). If you are a power user, you can disable core parking by going to registry entries or the programs below. How can this speed up my computer? Imagine that you have four engines and every time you stop and start you also turn some of the engines on and off. With all of your CPUs ‘on’, your engines are always ready to go. Does this work on all processors? No. Has there been reported improvements? Yes. You can download Disable CPU Core Parking here or manage them with Core Parking Manager here (just above the ads – it will be Download Application Executables). If you elect to change the registry, you can look for the string 0cc5b647-c1df-4637-891a-dec35c318583 and make adjustments. Use the programs. My preference is to UnPark all of the processors. It will TAKE SOME TIME to scan your registry. Be patient while it searches the registry. 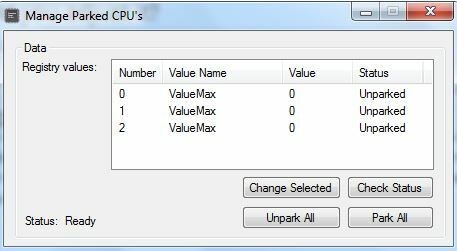 You can use the Core Parking Manager now to adjust the power settings and insure your CPUs’ power is set appropriately. You can unhide the Core Parking Manager feature in the power management settings and control it on the fly. 100% disables core parking completely and 0% allows all cores to be parked. This entry was posted in Computer hardware, Computers, freeware, Information Technology, Technology, Windows and tagged computer hardware, computer tweaks, core parking, cpu core parking, cpu tweaks, frame stutter, gaming tweaks, increase fps, Steam, Windows 7 Tweaks, Windows games. Bookmark the permalink. 3 Responses to What is core parking and should you adjust it?